This kind of early international recognition is a great reward for a major effort by the men and women of MetaMoJi who do their best every day to help businesses and consumers achieve greater productivity with their mobile devices. MetaMoJi Share was named this week as the winner of a Gold Stevie® Award at the 11th Annual International Business Awards. The award came in the Business and Government division, Apps Award Category and was presented to MetaMoJi staff at a grand gala ceremony in Paris, France over the weekend. MetaMoJi Share is a cross-platform group whiteboard app which provides a shared workspace for teams to collaborate from any device. Available across iOS, Android, and Windows 8 mobile platforms, MetaMoJi Share instantly connects team members to a shared collaborative whiteboard from anywhere in the world – regardless of their mobile device. MetaMoJi Share is a complimentary tool to popular meeting solutions like Google Hangouts, Skype, Cisco WebEx, GoToMeeting and TeamViewer. It creates a simply designed global workspace, making it possible for teams to visually collaborate from the palms of their hands. Real-time results of all team collaboration will appear on each team member’s device. Based on MetaMoJi’s multi-award-winning note-taking app, MetaMoJi Note, MetaMoJi Share supports simultaneous interaction of up to 100 authors working in the same digital workspace, all in vector graphic resolution. The enterprise editions also provide central IT management and deployment options. 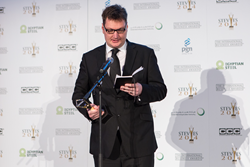 The Stevie® Awards are the world’s premier business prizes. They were created in 2002 to honor and generate public recognition of the achievements and positive contributions of organizations and working professionals worldwide. Since 2002 the Gold Stevie Award has been conferred for achievement in business to organizations and individuals in more than 60 nations. Stevie Award judges include many of the world’s most respected executives, entrepreneurs, innovators, and business educators. Each of our awards programs harnesses the insights and talents of more than 200 judges every year. Past judges include Donald Trump, Tony Robbins, and Gary Hamel, who participated in an evaluation process of nominees that takes approximately three months. Stevie Award winners were selected by more than 250 executives worldwide who participated in the judging process this year. The judges’ recommendations for winners in more than 70 corporate and individual award categories are announced and celebrated annually. MetaMoJi was presented with the Gold Stevie Award for MetaMoJi Share at The 11th Annual International Business Awards banquet at The Westin Vendôme Hotel in Paris, France on October 10. MetaMoJi Share is a productivity app available for download in 13 languages on iOS, Android, and Windows 8 mobile platforms, Based on MetaMoJi’s multi-award-winning note-taking app, MetaMoJi Note, MetaMoJi Share supports interaction for up to 100 authors working in the same digital workspace simultaneously.